Heeeee... look at my cool looking geek glasses (which is ironic because there are no glasses at all. popped the glasses out)! I got these for P150 (around US$3). These babies are sunnies but I've decided that they are better off worn like this. What do you think? I also got a hot pink with black speckles pair. That I'm going to keep as sunnies. It seems like we are really moving into a new home next year. Whoo! A new room! I'm excited. My room right now is such a mess. It does look like a huge dumping ground of all my clothes and shoes. My dad gets mad every time he goes inside my room because it's filled with loads and loads of stuff. He'll go muttering that we (all the ladies) are all materialistic wanting to go shopping all the time. Maybe when I get my own room I'll be able to have space for all my clothes and shoes, yeah? And I'll be able to do one of those shoe & room posts. I'm so ashamed to share my room right now because it's not a room anymore. It's a very messy walk-in closet with beds. Hahahaha. Oooh! I love the skirt & geeky glasses! where did you get it? 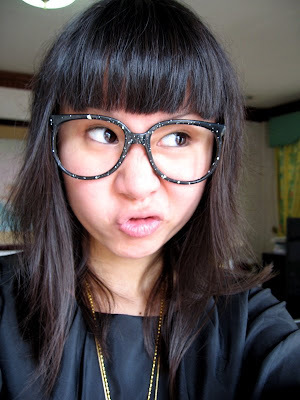 I've been looking for nerdy glasses like that, found oone at American Apparel for like $60 :( ang laki ng difference! i love your glasses! they're soo cute! sis, you look like a blythe doll..hehe! you look so cute! i love the oversized top with a nice fitted skirt. I love the speckles on the glasses, and they really suit you! cant wait to see the pink one!! heeee! i am so glad you don't recognize the news set! wheee! Wonderful outfit, so girly and womenly at the same time.